Brightly colored lattice bells inside for hours of enjoyment. 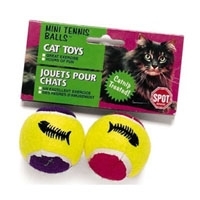 Mimi Tennis Balls have bells inside that catnip! They encourage exercise and fun! 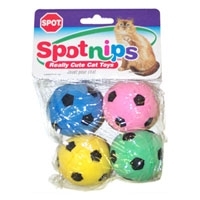 Colorful slotted balls with bells are sure to keep your feline entertained. 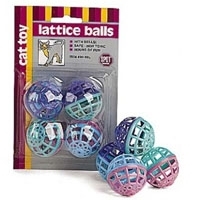 Shimmering plastic balls that rattle are sure to keep your feline entertained. 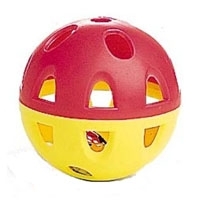 Brightly colored neon ball has a bell inside to keep cats happy and having fun! Ball is a full 2.5 inches. Sponge Soccer Balls are fun to toss & catch. Brightly colored and super soft will give your feline endless entertainment. 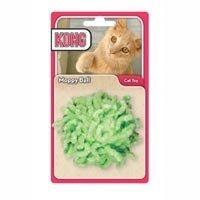 Your cat will enjoy stalking, pouncing on, and attacking the KONG Moppy Ball that’s fun to claw. 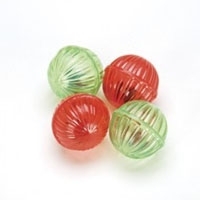 A rattle sound adds extra excitement to stimulate play. Watch the natural hunting instinct take over as your favorite feline discovers their new prey. 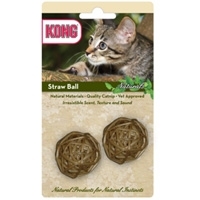 The KONG Naturals Straw Balls are specifically designed to appeal to your cat’s natural hunting instincts. The unique straw weave has lots of nooks for easy snagging and its unpredictable roll adds to the fun. These toys are designed to appeal to the natural instincts of the indoor cat. 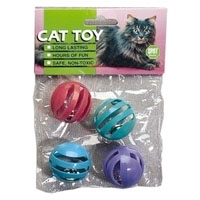 KONG Naturals are ecologically responsible cat toys. The materials and dyes used come from natural, renewable resources. 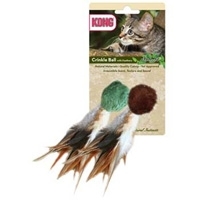 The KONG Naturals Crinkle Ball w/ Feathers are specifically designed to appeal to your cat’s natural hunting instincts. The crinkle sound instantly sparks curiosity — and the combination of natural fabric, feathers and catnip provide exercise and entertainment. These toys are designed to appeal to the natural instincts of the indoor cat. 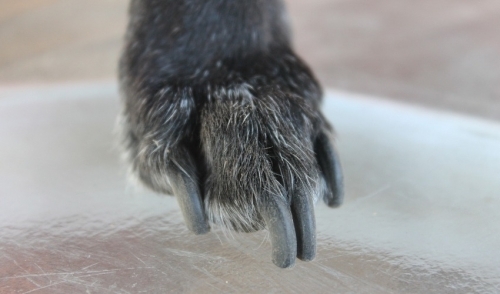 KONG Naturals are ecologically responsible cat toys. The materials and dyes used come from natural, renewable resources.